Asparagus spears grow from crowns, a rounded root and stem system that grows beneath the ground. The crowns are planted in the spring. New sprouts are harvested when they reach 10 to 12 inches in length. Once harvested, new sprouts will appear. Each crown will, optimally, produce up to 1/2 pound of asparagus spears per year, once fully established. Because asparagus is a perennial, it will also produce year after year. While planting asparagus is a relatively easy process, growing asparagus requires patience to a allow the plant several seasons to become well-established before harvesting. Remove any weeds from the planting area, particularly any perennials that may compete with the asparagus plants for nutrients and may be difficult to eradicate once the asparagus is established. Plant 1-year-old asparagus crowns, such as male hybrid varieties Jersey Giant or Jersey Knight, from a reputable grower and be sure they are healthy and free of disease. Plant the asparagus crowns in early spring when the soil has warmed up to about 50 degrees F. Dig a furrow no deeper than 6 inches. Place multiple furrows 5 feet apart, from the center of one row to the other. Apply about 1 lb. of triple superphosphate or 2 lbs. of superphosphate fertilizer for every 50 feet of row to the bottom of the furrow before planting. Place the crowns in the furrow, spacing them about 1-½ feet apart. Backfill the furrows to the original soil level. Do not compact the soil. Irrigate the crowns, watering them in until the soil is thoroughly moist. 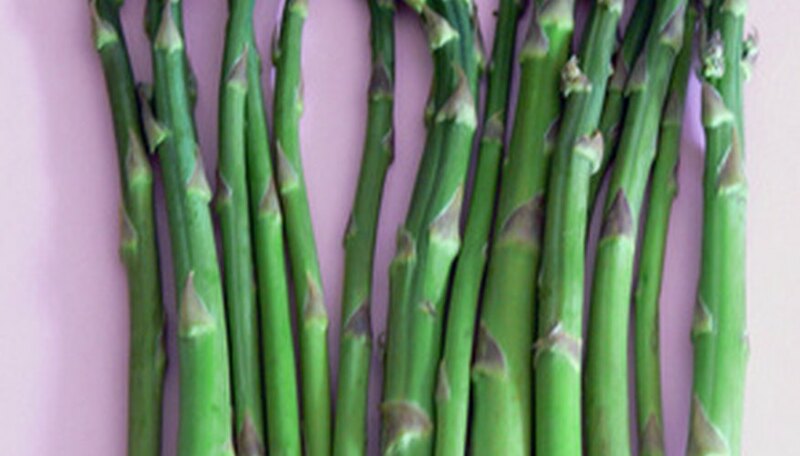 Do not harvest asparagus spears during the two or three years after planting. This will allow the crowns to become fully established and produce regularly and prolifically each proceeding year.